How would you react to such an introduction? If we’ve just met, and I ask you to buy something, you’re probably going to resist my offer for a number of reasons. You don’t know me, you don’t trust me yet and you may not even understand what I am selling. This request has less friction, because I am asking for a smaller commitment from you than I did when I was asking you to buy from me. Oddly enough, if we spend enough time together, and I demonstrate enough value to you, there may come a time when you have almost no resistance to buying from me. In other words, the friction can be removed from the relationship. This is a simple concept that even the most inexperienced salespeople understand. But, I use it to parallel the sales process that is used online on your website and in your Internet marketing. How can I ask you to buy something from me without building trust, demonstrating value and reducing your objections. This is where I should point out the direct correlation between the size of the commitment you are asking for and the friction that you will encounter. In physics, friction is the resistance that will slow a moving object down. Similarly in sales, friction is anything that will slow down or stop a potential customer in the sales process—the process that you design. It’s important to script the experience a visitor has from end to end with this in mind. Just as our salesperson is hoping to secure an appointment or an order for his widgets, your campaign or website should be targeting an end goal. When setting that goal, it’s important to keep the perceived friction in mind of your call to action. For instance, there is not much friction in asking a user to download a free guide that educates them on your industry or products. But, there is much more friction associated with asking a new visitor to hire you or buy from you. A free estimate or consultation might fall somewhere in between the two. 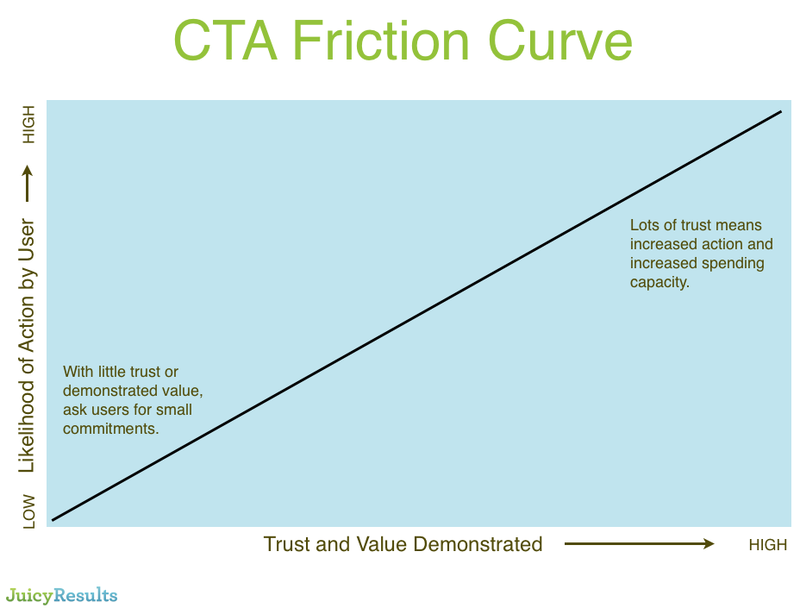 The point here is that a high friction call-to-action will require you to demonstrate more value to the user and build more trust. Make sure to design enough value and trust into the website or landing pages based on the call-to-action you target. It doesn’t take a ton of marketing experience to learn that a free guide that requires only your name and email will convert at a more successful rate than selling a $300 research report. Takeaway: Strategically match the commitment you ask of people with the level of trust and value they have in you at every point in your marketing. If you’ve ever researched a problem online, you’ve surely ran into a company who is happy to help with some key information at no charge. And, it’s no surprise that this information is designed to help you come to the conclusion that the sponsoring company is the right company to help you solve this problem and other related problems. By reducing the friction of your call to actions, you can convert more visitors into relationships that allow you to continue marketing to them over time. However, it is also important that you find a call-to-action that supports your sales process and actually provides value to you. Since you are likely paying for your website traffic one way or another—in the form of search engine marketing, social media and/or advertising—you should be seeking a balance of value to you and ease to the visitor. The sweet spot will deliver valuable leads for your business without encountering so much resistance that the traffic fails to convert. 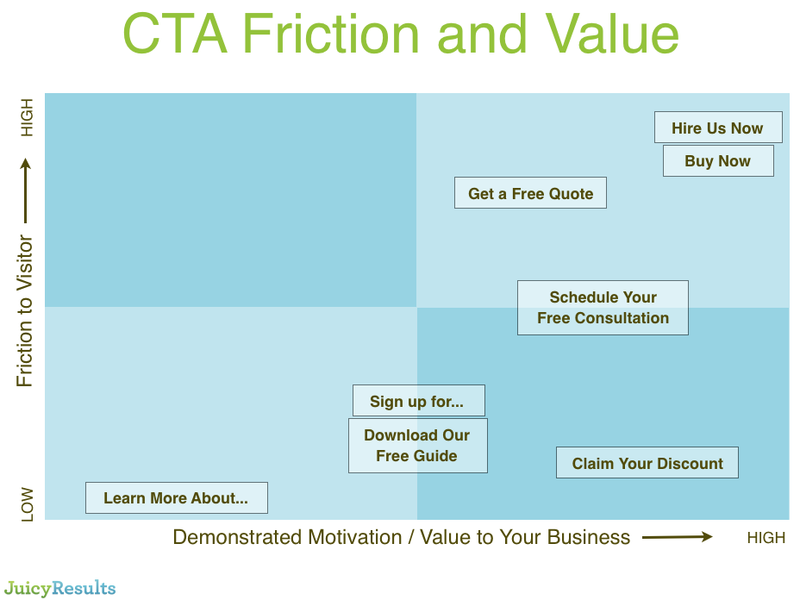 To design a successful marketing campaign, understand how much friction might be associated with your call to action based on who you are marketing to by plotting it on a chart like the one below. If you are marketing to complete strangers, you may want to start low on the friction curve with a free download or consultation. If you are marketing to a list of current customers or warm leads, you might be able to move up the curve with more confidence and find success. Use a chart like the one below to map out where your call to action might fall. Ask yourself if the traffic that will coming to those pages will have enough trust in you by that point, and if you can safely demonstrate enough value based on what you asking that user to do. Avoid a call-to-action that is overly aggressive based on the value you are providing on your website and landing pages. Start small and build the relationship and your Internet marketing will start to take off! Consider attending our free webinar to learn more about generating leads online for your small business.